If you decide you want a built-up rooftop deck, I would highly recommend that you hire an experienced roofing company to do the roofing installation. Installing built-up roofs is a messy and dangerous job. But, it doesn't hurt to also know what is involved in creating this kind of a rooftop deck so that you are better prepared when you are receiving bids and selecting your contractors. This is a basic run down of what is involved in creating a built-up rooftop deck. 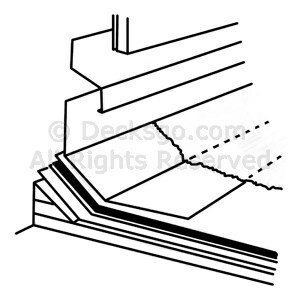 The roof structure must be engineered to handle the weight of a deck so joists should be 12" to 16" on center. Insulate between the joists from underneath. The sheating should be 3/4" tongue and groove, glued and screwed. Apply 45 degree cant strips as a transition against the wall. The cant strips should be equivalent to a 4x4 cut across the diagonal, not a 2x2. Base felt may break unless it bends gradually. Then appy 40lbs base felt in courses parrallel to and starting at the eaves. It should be nailed down to the sheating at 6" along all edges and 18" everywhere else. The top of the base should be hot mopped and the first 12" wide course of 15 lbs felt laid out parallel to the eaves, then full width sheets in each course to the wall. The second layer should start with a 24" wide strip and the third layer with a 36" wide strip. Hot mop between each layer. Go three or 4 layers with base flashing going over the cant strip and up the wall 12". It can be fixed in place with the hot mop. Flashing at base up wall at least 8", gravel stops overlap any eavestrough, then base flash over the gravel stop. When the flood coat has cured, layout strips of 90 lb roofing material on the flood coat where the deck sleepers will sit. Secure the roofing material to the roof surface with cold mastic or roofing tar. 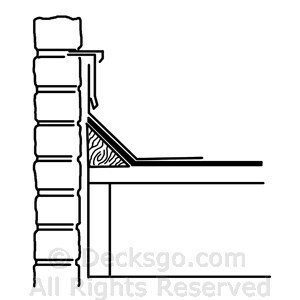 The sleepers should run parallel to and be directly over the joists in the roof. Never set the sleepers in between the joists because there is no support below. And never set the sleepers perpendicular to the joists because the water will not be able to run down the roof to the eavestrough. If you understand these basic steps to properly installing built-up rooftop decks, you will be in good shape when you meet your roofing contractor.